Tom Petty and the Heartbreakers bust out the hits for "manic" crowds on a sold-our summer tour. "I'm fifty-four, and girls are throwing their underwear at me," says Tom Petty, who's in the middle of one of his most successful tours ever with the Heartbreakers. "The crowds are just manic -- in Boston, they were singing so loud they actually drowned us out," he adds, on a rare day off from the road. "We're seeing more young people coming in, and it's just getting huger. I don't know how to explain it." 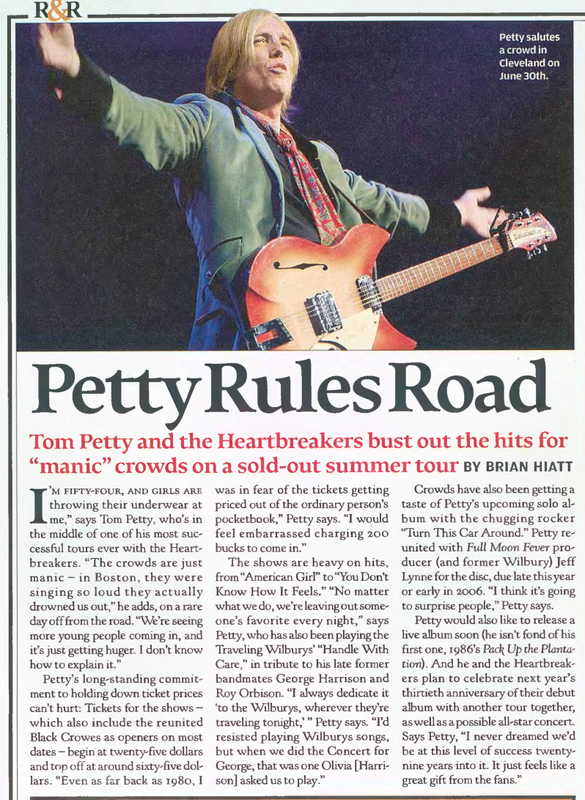 Petty's long-standing commitment to holding down ticket prices can't hurt: Tickets for the show -- which also include the reunited Black Crowes as openers on most dates -- begin at twenty-five dollars and top off at around sixty-five dollars. "Even as far back as 1980, I was in fear of the tickets getting priced out of the ordinary person's pocketbook," Petty says. "I would feel embarrassed charging 200 bucks to come in." The shows are heavy on hits, from "American Girl" to "You Don't Know How It Feels." "No matter what we do, we're leaving out someone's favorite every night," says Petty, who has also been playing the Traveling Wilburys' "Handle With Care," in tribute to his late former bandmates George Harrison and Roy Orbison. "I always dedicate it 'to the Wilburys, wherever they're traveling tonight,'" Petty said. "I'd resisted playing Wilburys songs, but when we did the Concert for George, that was one Olivia [Harrison] asked us to play." Crowds have also been getting a taste of Petty's upcoming solo album with the chugging rocker "Turn This Car Around." Petty reunited with Full Moon Fever producer (and former Wilbury) Jeff Lynne for the disc, due late this year or early in 2006. "I think it's going to surprise people," Petty says. Petty would also like to release a live album soon (he isn't fond of his first one, 1986's Pack Up the Plantation). And he and the Heartbreakers plan to celebrate next year's thirtieth anniversary of their debut album with another tour together, as well as a possible all-star concert. Says Petty, "I never dreamed we'd be at this level of success twenty-nine years into it. It just feels like a great gift from the fans."